Manufacturers are increasing productivity 15-20% by addressing a flaw in toolholder-retention knob design that affects precision and increases cycle time. Is Small Design Flaw Robbing Manufacturers of Valuable Time and Productivity in Milling Operations? What if a small investment in time and attention could yield an increase in milling productivity by 15-20% across the boards? While some may immediately tune out because it sounds “too good to be true,” an increasing number of manufacturers that machine parts are learning they can significantly increase cycle times and productivity by resolving one of the most fundamental and longstanding problems in machining: improper seating of the toolholder in the spindle. This small fact robs machining operations of valuable time, affects tolerances and precision, shortens tool and spindle life and even increases power consumption. Yet despite widespread evidence of uneven wear patterns and simple “touch-off” tests that immediately identify it as an issue, the industry has largely ignored this aspect of machining and, unwittingly, are paying a significant price for it. “In my role as an executive, anything that reduced costs or improved efficiency got my attention,” says Joe DaRosa, former president at Toyota Manufacturing of Texas. 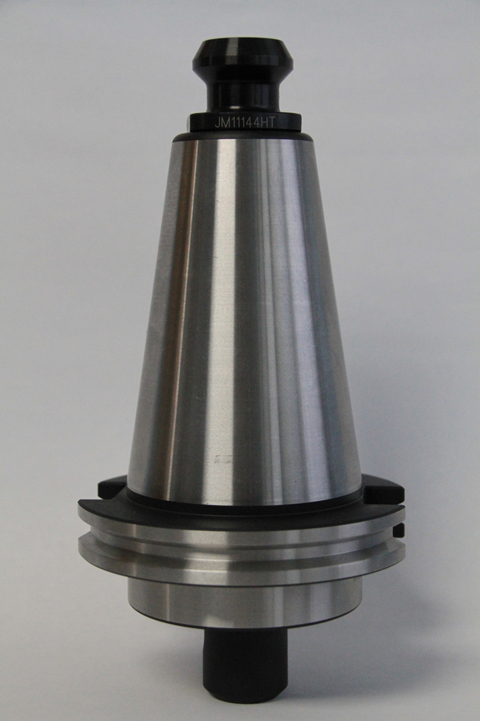 According to DaRosa, improper seating of tapered toolholders in the spindle is often overlooked as a factor in the performance and efficiency of CNC milling equipment. “Companies purchase top-of-the-line machining centers for a half a million dollars or more and buy the most expensive cutting tools, yet they completely ignore the interface between them: the toolholder and the retention knob,” says DaRosa, adding that the purchasing decision for these items often comes down to the lowest priced options, including overseas. So, when he first learned about an inexpensive fix to a machining problem that even by conservative estimates could increase productivity 15% and tool life even more, he was immediately intrigued. “If you’re an executive, you’re going to look at this [solution] and see reduced costs and increased productivity; If you are machining operator you will see increased tool life and less frequency of changeover,” adds DaRosa. Although the shank of tapered toolholders is ground to a fine finish to fit in the spindle within very precise, established tolerances, those that utilize drawbars are also threaded at the narrow end to accept a retention knob. The knob is designed to engage with the drawbar, which exerts a pull force that holds the toolholder firmly in the spindle. The problem is poorly designed, traditional retention knobs – a less than $20 part – when tightened create a bulge in the taper that prevents full contact and proper seating in the spindle. Once this expansion occurs, the toolholder will not pull fully into the spindle and so cannot make contact with upwards of 70% of its surface. However, the results are manifested in a wide range of CNC milling issues often attributed to other causes: vibration and chatter, poor tolerances, non- repeatability, poor finishes, shortened tool life, excessive spindle wear and tear, run-out, and shallow depths of cuts. There are solutions on the market today that address this design flaw. 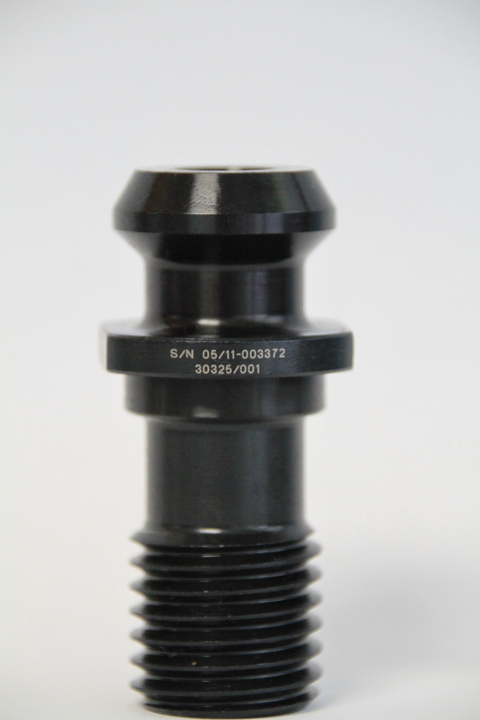 In 2009, JM Performance Products, Inc. (JMPP) introduced its High Torque retention knob. Invented by the company’s founder, John Stoneback, the product works with all existing toolholders including BT, DIN, ISO, and CAT toolholders from 30 taper to 60 taper. The High Torque retention knob is longer, by design, to reach deeper into the threaded bore of the toolholder. As a result, all thread engagement occurs in a region of the toolholder where there is a thicker cross-section of material to resist deformation. By combining the High Torque retention knob with the correct torque, spindle contact with the taper is improved to close to 100% every time. This can be verified by simple 6-step “touch off” test (www.jmperformanceproducts.com/toolholder-test.aspx). More sophisticated measurement of toolholder expansion (bulge) can also be taken using a taper shank test fixture. The solution can even provide V-flange toolholders with the rigidity and concentricity necessary for high speed machining of titanium, aluminum and other metals/alloys without having to turn to HSK or Capto tooling systems that are 2-3 times more expensive. For Dan Carlstrom of Carlstrom Associates, a manufacturer’s rep organization that sells toolholders, milling products and workholding systems, the “light bulb” moment came when he recommended the High Torque retention knob to a customer that was struggling with a boring product he had sold them. “They never gave me total cost savings, but needless to say it was significant. It also solved a huge headache for them,” adds Carlstrom. Carlstrom, who emphasizes that his company does not represent or sell JMPP’s High Torque retention knobs, says whenever he runs a test of his product for a customer he does so with the knob installed to eliminate poor seating in the spindle as a variable that could affect performance. In addition to increasing productivity, decreased tooling costs and set up times can increase revenues that more than justify the cost of High Torque retention knobs. Although the product costs nominally more than a traditional retention knob, at a conservative 10% increase in productivity, the ROI can be as little as 3 weeks. At a 20% increase, the ROI can be achieved in a week or less. Furthermore, manufacturers running 24/7 or having to add extra shifts to meet production demands could scale back, if so desired. With so much to gain, experts like DaRosa say the issue is simply lack of awareness. Although manufacturers are already benefitting from implementing the High Torque retention knobs, many consider it a competitive edge so keep the information close to the vest. Others remain unaware – even dismissive – that improper seating of tapered toolholders in the spindle is even a problem that has far reaching effects on machining.